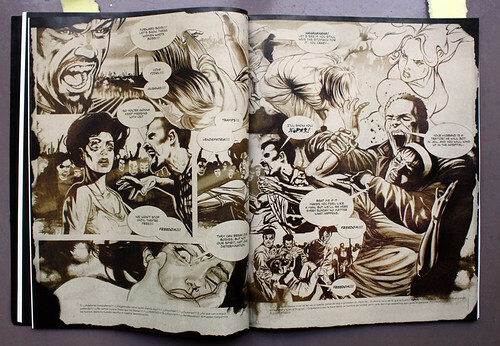 Rather than using photographic reportage, these efforts are conveyed in comic book form with additional commentary – and varying degrees of success. Despite the issue’s title, there are no capes, ray guns or kryptonite lurking in its pages – though in the story of Chilean hairstylist and drag queen Eduardo ‘Pamela’ Bijout, outlandish costumes do play a role. Bijout ‘uses his peculiarity as a special power … to make others happy.’ This is achieved by ‘listening to the problems and anxieties of his neighbours’, and by impersonating pop divas at charity events to raise funds for their medical expenses. This small and somewhat surreal act of kindness sits alongside other, more hazardous endeavours. Among them, the efforts of former Khmer Rouge child soldier Aki Ra (above), whose adult mission is to rid Cambodia of the land mines he was once trained to deploy. To date, Ra has defused over 50,000 such devices, of an estimated six million, armed with little more than a knife and a stick. Graphically, the more successful stories are those of the Cuban protest movement Damas De Blanco (below), a group organised by the wives of jailed dissidents, and Kru Nam, a Thai woman who rescues children from prostitution rackets. 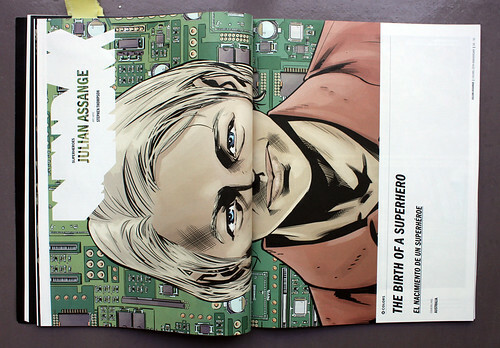 Less successful is the hagiographic account of WikiLeaks founder Julian Assange – titled ‘Birth of a Superhero’ (above) – which somehow sidesteps the activist’s comical narcissism in favour of telling us, breathlessly: ‘The sheer power and influence of what Assange is doing makes Spider-Man look pathetic … the world’s elites are running scared.’ No mention is made of Assange’s delight in publicising details of America and Britain’s security-sensitive infrastructure. 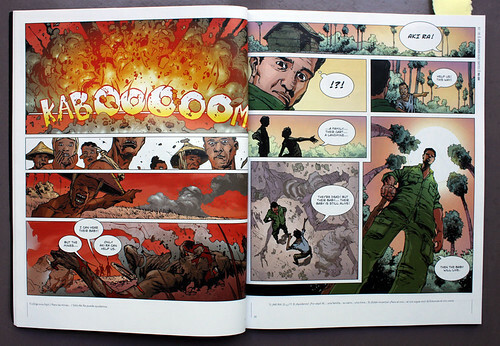 Heroism can come in unexpected forms – a point that this issue of Colors makes well, if unevenly. But I struggle to see much heroism in Julian Assange, a man whose most telling features are a blithe disregard for the fallout of his actions and a belief that America is the world’s most serious ‘threat to democracy’. Given the above, Colors 80 not only affirms notions of heroism, it also deforms them. This error may be due to naiveté and wishful thinking, but the megalomaniacal Mr Assange is perhaps better suited to a ‘Supervillains’ issue. Above: Biro bala Rabha – a woman who fights back against murderous witchcraft trials in rural India. 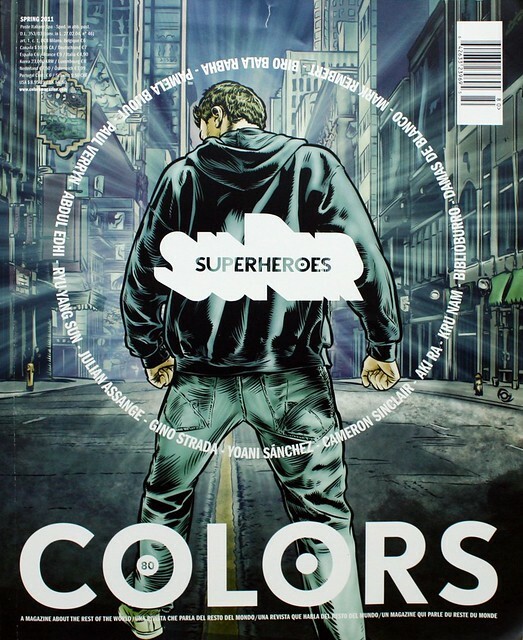 Colors 80: Superheroes. Colors magazine is developed in Italy by Fabrica, Benetton’s research and education centre, fabrica.it. 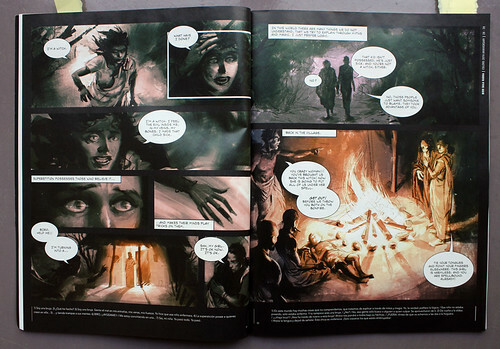 Read David Thompson’s personal blog – Culture, Ideas and Comic Books’ – at davidthompson.typepad.com.